The Harmar Aluminum Threshold Ramp is a lightweight yet durable, free-standing ramp designed for doorways, sliding glass doors and raised landings. 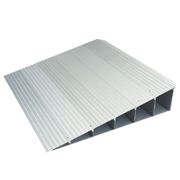 The Harmar Aluminum Threshold Ramp is a lightweight aluminum ramp improves access over almost any doorway threshold with a choice of sizes that simplify entrance over thresholds from ¼” to 4” . Pre-punched holes at the top of each ramp make installation quick and easy. 8" L x 32" W Threshold Height 1/4" - 1/2" 3 lbs. 10" L x 32" W Threshold Height 1/2" - 3/4" 4 lbs. 12" L x 32" W Threshold Height 3/4" - 1 1/2" 5 lbs. 16" L x 32" W Threshold Height 1 1/2" - 2" 6 lbs. 24" L x 32" W Threshold Height 2" - 4" 12 lbs.